By buying this product you can collect up to 1899 points . Your cart will total 1899 points that can be converted into a voucher of ₱1,899 . 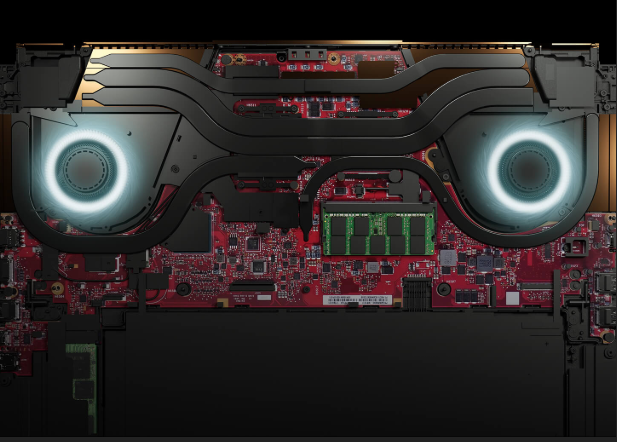 ROG Zephyrus S set the standard for ultra-slim Windows 10 Pro gaming laptops. Now it has bigger aspirations with a super-narrow-bezel 17-inch display in a chassis just 18.7mm thin. Zephyrus S GX701 is loaded with up to a GeForce RTX™ 2080 with Max-Q Design GPU and 8th Gen Intel® Core™ i7 CPU. Immerse in its 144Hz/3ms panel with Pantone®-validated colors, and use the ROG-exclusive GPU switch to change between G-SYNC™ for gaming and Optimus for battery life. Immersing yourself in a larger display usually means lugging a larger laptop, but slim bezels and smart design make ROG Zephyrus S the smallest in its class. Easily carry it around town or across the world thanks to compact dimensions that put a 17-inch display in a 15-inch form factor. The sleek magnesium-alloy body fits inside standard bags* and is strong enough to stand up to everyday life. Slender bezels draw you deeper into the action on the 144Hz IPS-level display. The high refresh rate makes gameplay smoother and lowers input lag, while the 3ms grey-to-grey response time produces sharper visuals with no blurring. Color accuracy and uniformity are critical for content creators, so factory calibration and ProArt™ TruColor Technology deliver a Pantone® Validated palette. Precise colors are paramount for artists, designers, and other content creators who work and play on the same machine. That's why the display is carefully calibrated at the factory. ProArt™ TruColor Technology guarantees that each one meets stringent Pantone® Color Validation requirements for color accuracy and uniformity. Live a double life powered by the ROG-exclusive GPU switch. With just a few clicks, ROG Zephyrus S transitions between better gaming and longer battery life. G-SYNC mode synchronizes the GPU and display to deliver smoother gameplay with lower input lag and tear-free graphics, while Optimus mode selectively turns off the discrete GPU to save power with everyday desktop productivity and entertainment. Zephyrus S features the latest Intel® Core™ i7 -8750H. With six cores and 12 threads via Hyper-Threading, it has 50% more cores than the last generation. There’s more power for serious work and heavy multitasking, plus effortless gaming with simultaneous recording and live-streaming. Intel Speed Shift and Turbo Boost balance performance and efficiency to deliver high speed and long battery life. 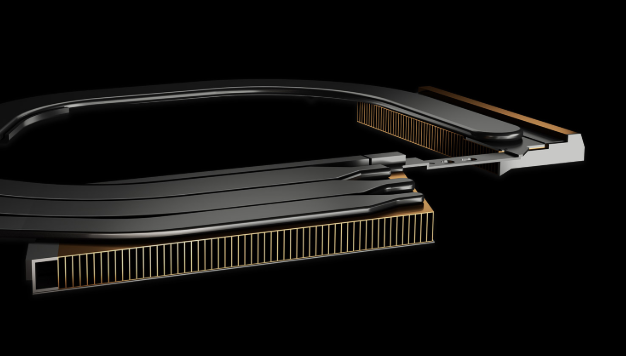 Ultra-slim laptops leave less breathing room for cooling, so the unique ROG Active Aerodynamic System (AAS) expands to help Zephyrus S sustain top performance for gaming and other heavy loads. Lifting the lid opens a large intake that increases airflow by up to 32% compared to typical designs. Anti-dust tunnels keep the heatsinks clean to preserve cooling efficiency and system stability over time. 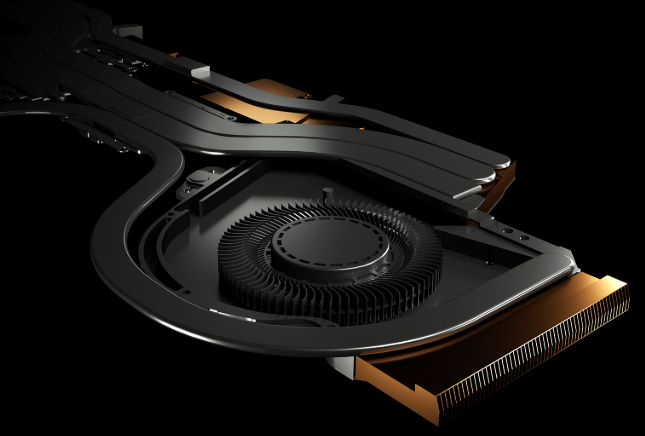 AeroAccelerator technology maximizes airflow inside the slender chassis. The carefully shaped aluminum intake shrouds use curved edges and raised guides to help the fans draw in more cool air. Once inside, it’s blasted toward the heatsinks by liquid-crystal-polymer blades that are 33% thinner than conventional designs. 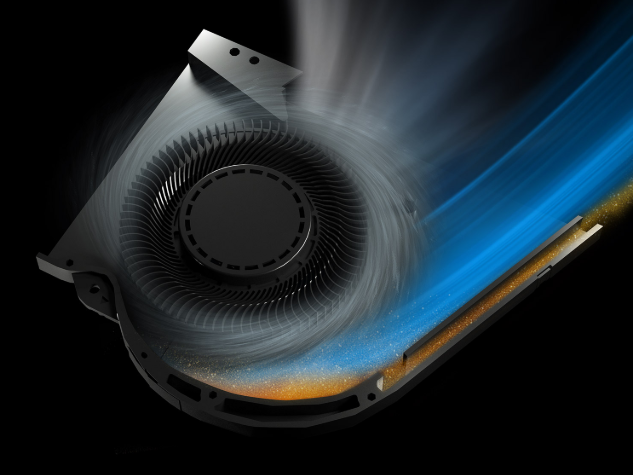 Zephyrus X achieves our highest-ever blade density with 83 per fan, improving airflow by up to 15%. The dual fans run on 12V power that lets them spin faster, improving airflow compared to typical 5V fans. They draw cool air from the expanding AAS intake below and vents perforating the chassis above. Exhaust is pumped through four outlets in the edges of the chassis, each one with a subtle ramp that helps separate warm outflow from the layer of cool air flowing into the AAS. Expertly tuned system profiles let you quickly adapt to different scenarios using a convenient keyboard shortcut. 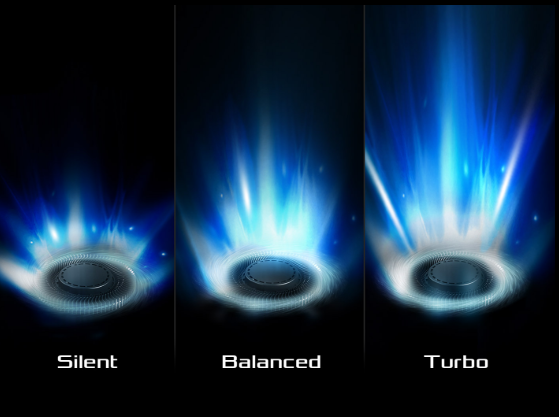 With the highest fan speed and frequencies, Turbo mode is the best for maximum performance. Balanced mode optimizes performance and cooling to lower noise levels under 40 dB* for gaming, while Silent mode goes further to take acoustics below 35 dB* for lighter work and entertainment. The forward keyboard position lowers surface temperatures on the desktop-style layout, so you can game in comfort for hours. Customize per-key RGB backlighting for different games and workflows, and match colors and effects with compatible peripherals using Aura Sync. Illumination extends to a unique volume roller positioned for quick adjustment and a glowing numpad that appears on the touchpad. Smart amplifier tech keeps the speakers within thermal and excursion limits when you spin the volume roller, so you can turn it up without harming the cones. The amplified output is louder, with more bass and range that help you hear enemies on the battlefield, dialog in videos, and subtleties of your productivity soundtrack. Plug in a headset for immersion, and go deeper with virtual surround sound. ROG Zephyrus S has all the connectivity needed for gaming and working on the go. One Type-C™ (USB-C™) port is available at USB 3.1 Gen 1 speed, while one Type-A port offers faster Gen 2 connectivity for devices that can keep up. Additional Type-A ports are perfect for a gamepad, mouse, or USB storage. HDMI 2.0 supports 4K UHD displays up to 60Hz, so you can game and entertain on big-screen TVs. ROG Zephyrus S features multi-antenna Wi-Fi. Patented ROG RangeBoost technology utilizes hardware and unique algorithms to boost Wi-Fi throughput and provide 30%-wider coverage than dual-antenna configurations. This gives you more stable connection for online gaming. Upgrade your stream with the ROG GC21 external camera. It captures crisp Full HD detail at a silky 60 FPS that makes movement smoother and more nuanced. Despite doubling the frame rate of conventional cameras, ROG GC21 folds to just 17mm thin and slips easily into a pocket. Position the USB-connected camera anywhere for the perfect angle, and be heard clearly by the beamforming microphone array.